A "roundabout" is a form of circular road intersection at which a vehicle slows down its speed to yield on entry and enters a one-way path around a central island. Improving conventional circular junction types, which are called "rotaries", roundabouts have come into wide use especially in America and Europe, including the U.K. and France, because of their advantages of high level of safety and efficiency. This issue picks up Ourston Roundabout Engineering Inc., one of the leading roundabout design teams in North America. Its subsidiary company Ourston Traffic Solutions, Inc. specializes in traffic modeling, providing state-of-the-art software solutions. As a part of this, Ourston Traffic Solutions adopted the license of UC-win/Road, 3D real-time VR (virtual reality) software of FORUM8. In early autumn in 2009, the Company became a FORUM8 Premier Partner in North America. In recent years, advantages of modern roundabouts have been recognized in the United States, too. However, there seems to be confusion with the older types of circular intersections such as "rotaries" or "traffic circles". Thus, it was required to get appropriate understanding of the parties concerned by explaining in advance the structure and uses of a roundabout design depending on its individual location as well as its effects and benefits. In searching for the way to satisfy such needs more effectively, Ourston Roundabout Engineering Inc. introduced UC-win/Road in early summer in 2009. On November 20, Ourston Roundabout Engineering Inc. took part in the 8th "3D VR Simulation Contest" sponsored by FORUM8 and held in Tokyo. 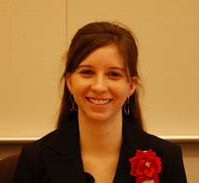 Ms. Amanda Stubbe, Design Engineer of the Company visited Japan to make a presentation at the contest. As she uses the software as a tool, we asked her to talk from her point of view. 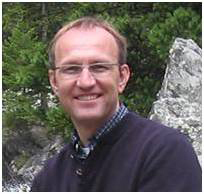 In addition, Mr. Mark Lenters, President of the Company, answered our questions by e-mail to complement the interview. 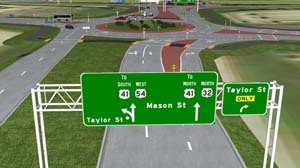 Adoption of Roundabouts and Their Problems in the U.S.A.
Ourston Roundabout Engineering Inc. (Ourston) is a specialized transportation design consulting company of 10 staff, mostly engineers. 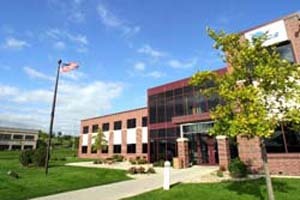 Based in Madison, the state capital of Wisconsin in the United States, Ourston covers all over the nation. In Canada, it operates business as Ourston Roundabouts Canada. Ourston started to design safe, high-capacity roundabouts in demanding locations in 1984. Since then, collaborating with other professionals, they have been making efforts in utilizing roundabouts to relieve traffic congestion, achieve high capacity, increase safety, slow high-speed roads, and upgrade freeway-to-street interchanges. Their design accomplishments include the first two modern roundabouts in America (Las Vegas, Nevada, 1990), the first roundabout interchange on I-70 in America (Vail, Colorado, 1995), and America's first string of roundabouts to eliminate congestion (Avon, Colorado, 1997). Additionally, Ourston helped the states of California, Florida, Kansas, Maryland, Michigan, and Wisconsin start their roundabout programs. 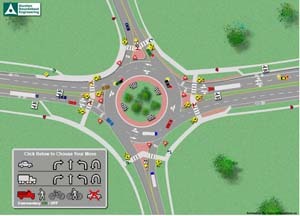 They have also written several articles and a design manual on roundabouts, and produced roundabout educational videos. Though roundabouts are becoming common throughout the world, the United States has been showing a tendency to hesitate to construct roundabouts. However, as recognition that they provide safer and more efficient traffic flow than traffic signals, agencies in the U.S. are just now becoming committed to adopting them. In fact, in the U.S., the general public is not familiar with roundabouts. Moreover, there are several types of circular intersections, and the terminology is often incorrectly used. Therefore, it was required first to have various parties concerned understand the mechanism, usages, and advantages of roundabouts along with their differences from the older types of circular intersections. In such occasions, visualization of a transportation project in a virtual setting is becoming more attractive to agencies. The virtual reality technology has been in use for nearly 20 years; however, it is only recently that it is more popular as computers become more powerful and designers and agencies recognize the benefits of illustrating the project. 'Seeing is believing' is a term that is used to describe the positive benefits of showing the public participant the 'before and after' effects of the project changes. Mr. Mark Lenters especially pays attentions to the advantage of being able to easily represent road widening or alignment changes in explaining a new type of intersection such as a roundabout. One of the projects that Ourston is involved with is a construction project including a large number of roundabout intersections, one of the largest-scale projects in the northeast area of Wisconsin. Initiated by the Wisconsin Department of Transportation, this is an expansion and improvement project covering two segments of US 41 totaling 31 miles (about 50km). This project includes road expansion to accommodate traffic volume, 44 new roundabouts, improved interchanges, and expansion of the causeway at Lake Butte des Morts. As part of the preparation for constructing the roundabouts, a proper education campaign to inform the public about how to properly drive through a roundabout was thought to be important for the success of this project. So Ourston used the UC-win/Road product to develop a driving simulator to train drivers on the correct use of the roundabouts. In such cases, educational videos and paper information materials have been available, but a driver how-to has never been prepared using a VR model of a roundabout, at least not in the United States, according to Mr. Mark Lenters. Ourston developed bird's eye views looking high above the freeway traffic interchange as well as driver's views to help educate drivers. 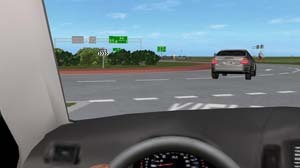 In addition, a computerized steering wheel and pedals were used to control vehicles and provide yet another tool to help educate drivers and to simulate driving through roundabouts. Ourston’s aim was to provide several methods of illustrating correct operation in a roundabout, especially lane choice on the approaches. It was in spring 2009 that Ourston started the business talk towards introducing UC-win/Road. After concluding a contract, Ms. Amanda Stubbe has exclusively used UC-win/Road to model roundabouts since last June. The completed driving and fly-through scripts were used to produce the high quality driver training videos. Some of the scripts were also presented at the "3D VR Simulation Contest" held by FORUM8 mentioned above, receiving the Overseas Award. Ourston has been searching for improved methods of educating the public on how to drive roundabouts so far. In doing so, Ourston has been using VR to show the public how to navigate through a series of intersections where roundabouts will be constructed in the future, traffic simulation software to analyze the predicted traffic flow, and two dimensional animation. 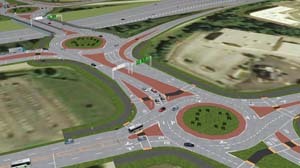 In this point of view, Mr. Mark Lenters thinks that UC-win/Road, with which they can show the driver view of the roadway and how to operate in a roundabout intersection with ease and high precision, will be an attractive tool for companies like Ourston that specialize in design of traffic interchanges and intersections. He also mentions the support system of FORUM8. He emphasized that they received excellent support from FORUM8 staff in developing a complex roadway corridor. On the other hand, Ms. Amanda Stubbe, who has actually been working with UC-win/Road, had no problems in working by trial and error while reading through the manual, except that she asked for help to FORUM8 staff through e-mails and the Internet. "In the field of transportation engineering roadway designers need to take advantage of these innovations to present the public with the best possible illustration of their proposed projects," says Mr. Mark Lenters. In other words, he thinks that public acceptance of new traffic devices or expanded road systems is much improved with the use of VR in the hands of a skilled designer. In this sense, as the precision of traffic simulation improves, the benefits of VR and driving simulation will also increase. This should lead to creating an animation and simulation of traffic conditions that will resemble the expected conditions of the built project, as he describes his hope in the near future.